VCDX – Why Assume Anything? Why are we assuming things like these? If your design relies on these ‘Assumptions’ to meet SLA’s then would it not be a good idea to actually find out if these ‘Assumptions’ are actually correct? 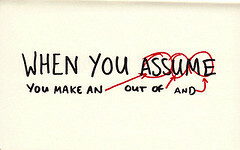 Documenting assumptions is not a waiver that implies ‘this is the customers problem’. As an Architect it is your responsibility to assist your customers to by identifying areas of their existing environment that may or may not be able to support your design. Don’t assume there are enough DHCP IP Address for your virtual desktops. Figure out how many you need, document it and talk to your customer about the requirement and understand if this is something that can support. If it’s not, you might actually have to change your design because of this constraint. Common VCDX Mistakes: What SLA?